Aqualite Outdoor TV screens and display panels are resistant to rain, sleet, snow, ice, high humidity, low humidity, heat, sunlight, dust and insects. Combining modern cutting edge design with the latest LCD TV technology, the Aqualite range of IP66 waterproof & weatherproof TVs are suitable for outdoor and indoor entertainment, outdoor digital signage & external advertising displays. Aqualite”s range of outside TVs even come with fully waterproof cables and connections for installation in gardens and patios, in damp or wet areas around swimming pools or even for use in harsh marine enviroments on board yachts and boats. 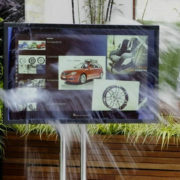 Designed with stylish weatherproof casings, 6mm toughened glass and an anti-glare and anti-reflective film, our LCD, LED, HD & Smart TV screens deliver crystal clear digital images for all outside locations, whatever the weather, come rain or shine. Follow the link for more information about becoming a distributor or supplier of Aqualite”s range of waterproof, weatherproof, heat proof, humidity proof, insect resistant outside TVs and display panels.